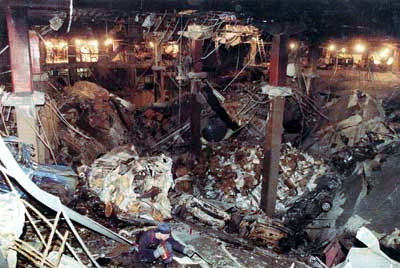 From left, clockwise: The Hubble Space Telescope orbits the earth after it was launched in 1990; American F-16s and F-15s fly over burning oil fields in Operation Desert Storm, also known as the 1991 Gulf War; The signing of the Oslo Accords on 13 September 1993; The World Wide Web gains a public face during the start of decade and as a result gains massive popularity worldwide; Boris Yeltsin and followers stand on a tank in defiance to the August Coup, which leads to the dissolution of the Soviet Union on 26 December 1991; Dolly the sheep is the first mammal to be cloned from an adult somatic cell; The funeral procession of Diana, Princess of Wales, who dies in 1997 from a car crash in Paris, and is mourned by millions; Hundreds of thousands of Tutsi people are killed in the Rwandan genocide of 1994. The Big Lebowski is a 1998 comedy film written and directed by Joel and Ethan Coen. Jeff Bridges stars as Jeff Lebowski, an unemployed Los Angeles slacker and avid bowler, who is referred to (and also refers to himself) as "The Dude". After a case of mistaken identity, The Dude is introduced to a millionaire also named Jeffrey Lebowski. When the millionaire Lebowski's trophy wife is later kidnapped by nihilists, he commissions The Dude to deliver the ransom to secure release. The plan goes awry when The Dude's friend Walter Sobchak (John Goodman) schemes to keep the full ransom. Steve Buscemi, Philip Seymour Hoffman, David Huddleston, Julianne Moore, Tara Reid, and John Turturro co-star in the film, which is narrated by a cowboy known only as "Stranger," played by Sam Elliott. Joseph Jacques Jean Chrétien PC OM CC QC (born January 11, 1934), known commonly as Jean Chrétien (French pronunciation: ​[ʒɑ̃ kʁetjɛ̃]), is a Canadian politician and statesman who served as the 20th Prime Minister of Canada from November 4, 1993 to December 12, 2003. 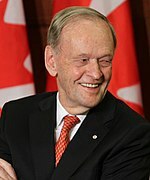 Born and raised in Shawinigan, Quebec, Chrétien is a law graduate from Université Laval. He was first elected to the Canadian House of Commons in 1963. He served in various cabinet posts under prime minister Pierre Trudeau, most prominently as Minister of Justice, Minister of Finance, and Minister of Indian Affairs and Northern Development. He also served as deputy prime minister in John Turner's short-lived government. He became leader of the Liberal Party of Canada in 1990, and led the party to a majority government in the 1993 federal election. He was re-elected with further majorities in 1997 and 2000. You are invited to participate in WikiProject Years, a WikiProject dedicated to developing and improving articles about years, decades, centuries, and millennia.